Drawing back the reins on her Doduo to pull the two-headed bird pokemon to a halt, Yellow looks over to Pallet Town, and knows that she has arrived at the first destination of her long quest. Dressed in cowboy outfit with a big straw hat on top, the youngster calls out to the children playing in the fields and dislodges from her Doduo. She pulls out a sketchbook to draw a picture of Pikachu on it, and asks the kids for directions to find the little electric rat. At Prof. Oak's research lab, the old man frantically picks up a badly injured Pika and rushes it to the HP restore machine. A horrified Misty takes a look at the battered little pokemon, and nervously inquires the professor about Red's current location. Oak picks up Bruno's letter of challenge to Red on his desk, and gets the hunch that the worst has happened. The boy has lost the match. The boy who has captured the title of champion in the previous Pokemon League has been defeated by a challenger named Bruno, and it appears that for some reason, he was not allowed to escape and is being held captive somewhere out there. Knowing that it is no ordinary business they're dealing with, the professor immediately tells Misty to notify all the other gymleaders belonging to the Alliance of Justice about the situation. With Misty off to spread the news, Oak is about to call his own acquaintace when his lab door is pushed open and a cowboy riding on a Doduo slowly enters. After greeting a baffled Prof. Oak, Yellow hops down and walks over to the HP restore machine. 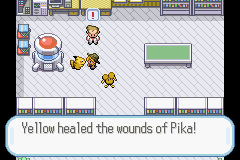 She deactivates the healing process and releases Pika from its pokeball. To the old man's surprise, Pika's wounds miraculously heal on their own except a small scar on its left ear, and the little rat soon becomes conscious again. He is about to get mad when he notices the obvious closeness shared by the young stranger and Pika. Without a word, Yellow starts walking out of the door with Pika tagging behind, and Oak hurriedly rushes after and demands an explanation to everything. With a determind look on her face, Yellow admits to the professor that she knew Red and Pika some time ago, and that she honestly has no idea where Red currently is, but she wouldn't reveal how she knew about Red's disappearance or her name. Oak starts to get mad, but Yellow tells him to trust her, and says she was sent on this journey by a friend of Red's who has learnt of his captivators. Professor Oak hesitates for a while, then pulls out a pokemon to release his Spearow. He remarks that if someone as strong as Red can't outsmart those who captured him, he seriously doubts that the youngster could do better. Yellow accepts the challenge and tells her Doduo, named Dodosk, to unleash a whirlwind. Oak's spearow creates a mirror moved whirlwind, but Yellow retaliates with yet another whirlwind. Though amazed by the youngster's tactics, Oak wonders how defensive moves could prevail in a pokemon battle. Yellow then orders Dodosk to run in circles around Spearow, leaving the old man to wonder even more. But Spearow all of sudden gets dizzy from both the spinning and swirling winds and starts to faint and fall down. Yellow immediately has Pika catch it, and Oak madly exclaims that it is a one on one battle. To his surprise, however, Yellow puts on an innocent smile and says the battle is already over. She pats Spearow on its back and remarks that it's good not to get pokemons hurt during a battle. Professor Oak looks at Spearow and the youngster's Doduo, and is greatly taken aback by the fact that neither pokemon has suffered any injuries during the whole combat. He realizes this mysterious youngster is no ordinary trainer and suggests continuing their talk somewhere else. Later, at Red's house, Oak takes the Pokedex Red left on the table and hands it to Yellow, saying that he knew the boy would have left his Pokedex behind when he's so caught up with pokemon battling. He then says although he knows that she keeps a lot of information up her sleeve, seeing how Pika trusts her, he believes her intentions are pure. He tells her to take the Pokedex and give it back to Red when she finds him. Yellow thanks the professor and heads out with Pika to embark on their long quest.